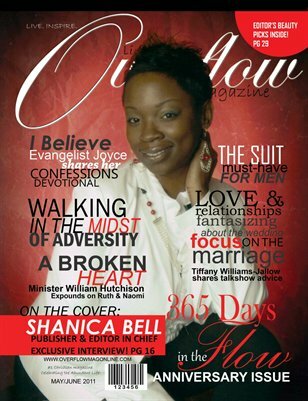 In our May/June 2011 Anniversary, Life in the Overflow issue, Founder and Editor in Chief, Shanica Bell celebrates '365 Days in the Flow' and graces the cover and shares in an interview why she decided to publish and what overflow means to her. Minister William Hutchison, Jr. also blesses us with his presence in this issue with 'A Broken Heart'. Evangelist Joyce Ralston shares 'I Believe' - a confession devotion and PMD takes us through 'Walking in the Midst of Adversity'. It's also wedding season approaching! Tiffany Williams-Jallow also shares how many women should focus on the marriage instead of the wedding. Also, The Black Scroll's CEO/Founder Shyra Smith, features with 'Taking Steps Get Ahead'. And more!